Let’s give a warm welcome to an adorable new animal friend. A baby pygmy hippopotamus has made his dazzling debut at Melbourne Zoo. 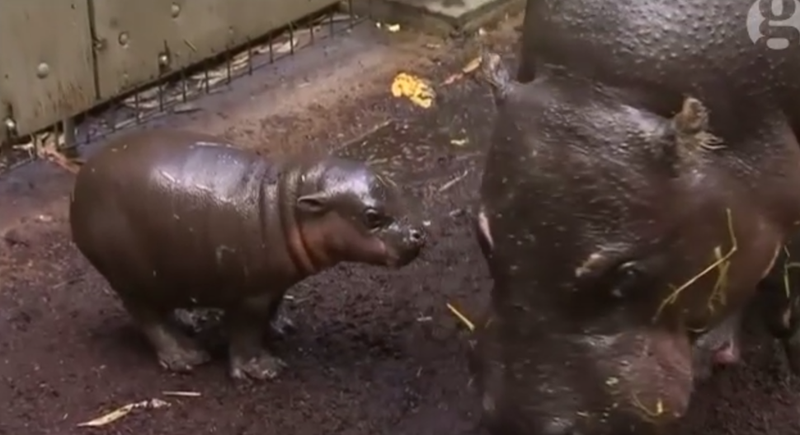 The tiny, yet-to-be-named hippo was the first one to be born at the zoo in 34 years. He’s doing well with his growth progress, putting on up to half a kilogram a day reports The Guardian. Pygmy hippos—which are endangered creatures—can grow to reach six feet in length and weigh up to 600 pounds. Petre, the pygmy hippo momma, has been staying close to her baby’s side. “Whenever he calls out to her she comes over straight away and looks after him,” Zookeeper James Uren told ABC News Australia. Once the calf gets older, he will be transported to Adelaide Zoo to participate in their breeding program. According to the Pygmy Hippo Foundation, it has been estimated that there are around 2,000 pygmy hippos left in the wild. Pygmy hippos, like many people I know, are mostly nocturnal, very secretive and relatively solitary. They hope to have a name for the little guy in the coming weeks. What do you think it will be? Jagger? William? Dwayne?